David Laws and the 50% tax rate: worse than calling a cop a pleb? As a liberal, I feel uncomfortable at the idea of the state taking half or more of anyone’s income. This is obviously meant to justify the acquiescence of the LibDem members of the coalition in the decision last March to reduce the 50% highest marginal rate of tax, instituted by the Labour government in April 2010, to 45%. Laws’s remark however seems calculated to perpetuate the myth that a taxpayer paying the 50% tax rate is paying half of his total income to the state. This widespread misconception results from a misunderstanding of the concept of a “marginal” tax rate. The highest marginal rate of tax, whether 50% or 45%, applies only to that part of the taxpayer’s taxable income which exceeds £150,000 a year. If your total taxable income in the year (i.e. your income after deduction of various allowances) is £149,999, not a penny of it is taxed at 45% or 50%. If it’s £150,010, only the last £10 is taxed at 50% (soon to be 45%). Everything up to £149,999 plus allowances is taxed at exactly the same rates as those paid by someone earning, say, £34,371, the amount at which the rate of 40% begins to apply (check rates for new card applications). 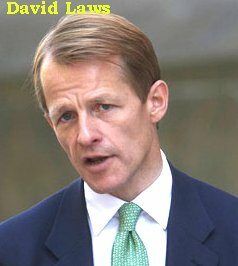 David Laws, as a former LibDem Chief Secretary to the Treasury (admittedly for only 17 days) ought to be able to grasp the meaning of a marginal rate of tax. Son of a banker, educated at fee-paying schools and with a double first in economics at King’s College Cambridge, for five years a senior investment banker, including a spell as a managing director at Barclays de Zoete Wedd, he’s no financially illiterate pleb. It’s a reasonable inference that he knows that a marginal tax rate of 50% starting at £150,000 of taxable income can’t mean “the state taking half or more of anyone’s income” (that sly insertion of “or more” making the innuendo even more untruthful). Either Mr Laws, a LibDem minister in the coalition government, didn’t know that his remarks were seriously misleading, in which case he was wasting his time as an investment banker and senior Treasury minister; or he did know, in which case…. It’s time that Labour nailed this damaging misunderstanding every time it surfaces. The case for the very rich to pay substantially more tax as part of their contribution to deficit reduction is unanswerable. This is one way to raise taxes without squeezing aggregate demand in the economy as a whole, since those earning — or at any rate receiving — more than £150,000 a year (plus tax allowances) have a very low marginal propensity to spend: almost every additional pound of their income goes into savings, often in off-shore accounts. That the coalition chose to reduce the highest rate of tax on the very rich while actually increasing the tax paid by even the poorest people in the country, VAT, thus significantly reducing aggregate spending power when lack of demand is at the root of the country’s disastrous economic problems, tells us all we need to know about the coalition’s priorities, demonstrating whose interests the Conservative-LibDem government is most anxious to promote. By comparison with such knowingly misleading spin, calling a copper a pleb is very small beer. Right, Mr Laws? In any case as a Cambridge economist and therefore an academic descendant of Keynes it’s pretty shocking Laws doesn’t understand how a monetary economy works! If the government is running a deficit, it is by definition paying out more than it is taxing. It’s a good bet therefore that a hefty chunk of any income being taxed at 45% or 50% originated from the government in the first place. So this ‘half of income’ business is a bit of a red herring – the total proportion of income going in tax will always depend on the relative size of the public and private sectors. And that is a decision that should be taken democratically on overall resource efficiency and equity grounds. I think there’s an even worse possibility, which is that he knew what he was saying. If you include National Insurance, a top rate of 50% could lead to some people paying more than 50% overall. Specifically, anyone earning more than £927,000 (and paying tax at source) pays a rate of more than 50% – although not very much more, and the rate rises very slowly; nobody pays as much as 52%, and the 51% mark is only reached at about £1.9 million. Essentially Laws is saying that, as a liberal, he feels intensely relaxed about people becoming filthy rich. Which at least helps us understand what ‘liberal’ means these days. Brian writes: Thanks for this, Phil: fascinating! One certainly has to feel sorry for anyone ‘earning’ about £1.9 million a year — or a good deal more — and paying back so much of it in tax and National Insurance, not least because such a person evidently can’t afford to employ an even minimally competent tax adviser and accountant! Having watched the Laws speech on TV, I was under the impression – rightly or wrongly – that he said he would be uncomfortable at the state ‘taxing half or more of anyone’s income’, not ‘taking’. Incidentally, on the lighter side, thank you for telling us about Gideon Oliver: how charming that Osborne’s initials spell ‘GOO’, which the OED defines as ‘a slimy or sticky substance’, no doubt a potential gift to our cartoonists. Brian writes: Many thanks for this, Clive. Personally I can’t see that it makes a lot of difference whether he said ‘taxing’ or ‘taking’ — the sense would be just the same although ‘taxing’ would make the remark rather obscure. On Mr Osborne’s name-change, I share your disappointment. Gideon is a great name for a pantomime villain, who gets to be booed by the audience just as poor ‘George’ was the other day. Surely taxing at a percentage rate (imposed on ‘half or more’) is different from scooping (‘taking’) the entire pot (of ‘half or more’). But, whichever Laws thought he meant, it still does not justify the reduction from 50% to 45% as the marginal rate on income in excess of £150,000, the disagreeable deal by which the LibDems won their sequential lifting out of tax of the low paid. They had to hold their noses tight, just as did many of those who voted in the London mayoral election. Brian writes: Whatever D Laws said or didn’t say, I don’t think he can have meant that any tax was levied on half of anyone’s income. That would mean that a banker receiving £2m in annual salary and an annual £3m bonus would get £2.5m of his income free of the 50% or 45% tax rate! As you say, whatever he meant, it can’t justify the LibDems’ acquiescence in the reduction of the 50% rate. And the tax experts have demonstrated that what they got in return (taking some low-paid people out of income tax by raising the threshold) did nothing for the poorest who don’t earn enough to pay income tax anyway, but produced a substantial benefit for middle- and high-income taxpayers! It’s anyway indirect taxes, especially VAT (sharply raised by the coalition), that cause the poorest in society to pay the highest proportion of their incomes in tax, something that the LibDems and their Tory masters have done nothing to remedy, actually making it worse instead. Without going into too much detail, I’m not convinced that “Mr Integrity” is a fit person to be in government, and I’m not all that interested in his views. Of course I may be quite wrong – I can only go on what he is alleged to have said about his alleged problems.